Mitch Wilson has got his sights set on the podium in this weekend's championships. 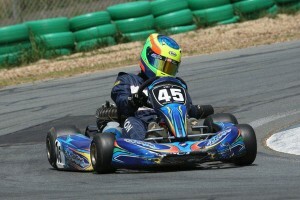 Geelong teenager Mitch Wilson is a man on a mission in the world of motorsport. This weekend the Lara Secondary student will mix it with Australia’s best young drivers during the Victorian Open Karting Championships at Port Melbourne and the 14 year-old has got his sights set on the podium. Last December, Wilson defeated the state’s best youngsters in the Victorian Closed State Championships but with this weekend’s event open to all drivers across the country he knows he’ll have to be right on top his game. “I won the Victorian Closed title, but only Victorian drivers are eligible to compete in that event, now I’ve got the best drivers from all across the country coming to compete – it’s going to be tough,” said Wilson. Wilson, who followed in the footsteps of his stepfather into the sport, started his karting career four years ago and continues to thoroughly enjoy the thrill of the speed and competitiveness of karting. “I really enjoy getting out there behind wheel. On the track we all race clean and fair in a very competitive way but then off the track we all have some fun as well,” said Wilson. Wilson’s motor racing idol is dual V8 Supercar driver Jamie Whincup, who is a former Australian Karting Champion. “I really like the way he drives,” said Wilson. Wilson will take to the track later this week for practice ahead of qualifying on Friday followed by the heat races on Saturday and the Championship Finals on Sunday. With more than 350 entries across 16 categories received for the event the racing will come thick and fast all throughout the weekend.